Mueskes Landscape and Snow Management provides lawn mowing and maintenance services to businesses, healthcare facilities, shopping centers and condominium communities. Back in 2004, Mueskes Landscape and Snow Management started business with only lawn mowing and has evolved into full service lawn care and commercial snow removal services. We offer seasonal plans that include lawn dethatching with the Spring clean up, weekly lawn mowing, fertilization programs, irrigation maintenance and installation, and Fall clean up of leaves. Also, we have a great working relationship with property management companies, and we fully understand their unique needs. 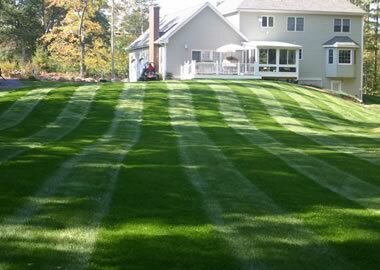 We can customize a schedule to accommodate business hours and preferred lawn care times. Your lawn is the first thing customers and visitors see when they arrive at your site, so let us create and maintain a great first impression! We strongly believe that a clean landscape will help to attract new customers, new visitors and tenants to your property. Rest assured your lawn will be well-maintained with a professional appearance year-round. Our lawn mowing crews use modern equipment and practice safe techniques while on your site. Expect to see green grass, crisp edges, weed-free mulch beds and spotless walkways after the crew is finished. At Mueskes Landscape and Snow Management, we provide a variety of commercial landscape management services year round to keep your commercial or industrial property looking phenomenal at all times! Our lawn fertilization programs can be customized to suit the needs of your lawn and stay within the limits of your budget. Beginning in April and running through October, our fertilization rounds include crabgrass pre emergent, turf builder, grub control, spot weed treatment, lime and winterizer applications. We also offer curbline weed control and tree and shrub fertilizer applications. A fertilizer technician will visit your site and recommend treatments based on the needs of your turf, trees and shrubs. In the Spring, we will use mechanical rake dethatchers to remove any thatch in your lawn to open up the roots and allow water and oxygen into the grass root system. In the Fall, we blow down your lawn and mulch beds, pick up and remove sticks and debris. Leaves left on the lawn over the winter can promote disease and stunt the lawn growth. Core aeration, if needed, can open up compacted soil to promote root growth. Fall is also a good time to overseed the lawn because of the ideal grass growing weather. Our goal is to promote a healthy, green, disease-free lawn to showcase your property. Our irrigation technicians will take care of starting your irrigation system in the Spring, as well as shutting it down in the Fall. The start-up includes turning on the water, programming the time clock, running the system and adjusting or replacing sprinkler heads. Normal wear and tear throughout the year will occur, and we ensure your system is running effectively and efficiently. We can also suggest modifications and install new irrigation systems to make sure your grass and flowers are watered properly. In addition to lawn care, we also install new lawns. Our trained staff has years of experience with hydroseeding and sod installation. Both hydroseed and sod provide rapid results and instant gratification. Starting with the right products makes the maintenance even more successful.